The Anglo-Saxon period dates from around the time of the end of the Roman Occupation (c. 410 AD) to the defeat of Harold at the Battle of Hastings (1066). Of course, our history goes back long before the Anglo Saxons to the Iron Age (and before) and to the Roman Occupation. Julius Caesar came to Britain in both 55 and 54 BC. The Roman Occupation dated from around 43 AD to 410 AD. Many of our cities and towns date from the Roman period (or earlier) - e.g. London (Londinium), York (Eboracum), Chester (Castra Deva), Bath (Aquae Sulis), Manchester (Mamucium) etc. The tribes of Iron Age Britain undoubtedly had their "law" and the Romans were governed by their own laws and attempted to stamp their authority over the inhabitants. 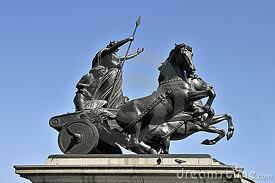 The brave stance of Boudicca (Queen of the Iceni) against the might of the Roman occupiers is one our earliest statements of a desire to be a people free from any foreign yoke. The Romans built highways linking their various garrisons and this is perhaps the origin of the phrase "All roads lead to Rome." They also created Hadrian's Wall. which features in the film "The Eagle" (based on the novel by Rosemary Sutcliff "The Eagle of the Ninth). However, it is more in terms of physical remains that the Roman legacy survives in Britain today. There is little direct survival of Roman Law though, in the Middle Ages through the Church, principles of Roman Law have come to indirectly influence some aspects of our modern law (e.g. wills). Roman Law has also been taught in our Universities and courses are still available. Roman Law had a much more profound influence on the legal systems of other nations including Scotland. of what existed by custom but sometimes stated new law and modified practices. 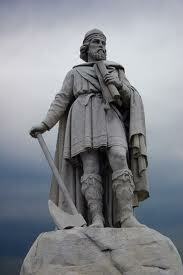 King Alfred claimed not to have made any new laws but chose the "wisest laws" of his predecessors. Another important feature of this period was The Witan (or Witanagemot) which was a King's Council. The Norman successor to this - the Curia Regis - was to become the source of our modern High Court of Justice. In his "Historical Introduction to English Law" - Professor Potter wrote - "Before William I landed on our shores England had for centuries some form of government, which had administered, after some fashion, a law which was rooted in the traditions of its people." Winston Churchill, in his monumental History of the English Speaking Peoples, wrote of the Saxon Dusk when, in the time of Edward the Confessor, "the lights of Saxon England were going out." Edward died on 5th January 1066 and it was to Harold that the mantle of Kingship fell though he was destined to carry this for only a short time. In October 1066, on Senlac Hill near Hastings, he was defeated in battle by William of Normandy whose expedition to England had been blessed by the Pope. Turning to Churchill once more - "... the English once again accepted conquest and bowed to a new destiny, yet ever must the name of Harold be honoured in the Island for which he and his famous house-carls fought indomitably to the end." The Normans did not set about instant replacement of the law which existed. Change was to be a gradual process taking many decades and perhaps centuries but the Norman Conquest had a major impact on our governmental and legal history. Constructive comments on this are more than welcome especially from those with good knowledge of our legal history. I hope to follow up with further posts. Addendum 26th April: This blogpost was reproduced on Legal Week to whom I express my thanks. Some time ago, I forget where, I read that the penalty for stealing another man's beer in Anglo-Saxon England was one-third of the penalty for murder. Now that is what I call an eminently sensible and just law! Interestingly the 'Roman' road between Wroxeter and Oswestry has just been carbon dated and turned out to date to approximately 600 years before the Roman invasion... Perhaps then the Roman effect was not quite as pronounced as previously thought. I would also add that as you suggest the change in English law was gradual after the Norman Conquest and may have happended anyway. The element of English consent always existed and Rufus, Henry I, Stephen et al. were all 'acclaimed' king by their subjects. The element of popular election remained right up to Richard III in 1483. Among other things, this article completely neglects to mention that nobles or local magnates were key power centres in the middle ages and were as important in dispensing justice and upholding notions of what was just (when it suited them and within their own interests). This article is not the worst though and mentions briefly some of the most interesting features of the early English legal system. The worst I have encountered in academic law are those who simply look back as a lawyer to institutions peculiar to the politics of the middle ages and try to discern the birth of the modern justice system (and often an accompanying modern democracy) with a linear progression from one to the other. Although a feature of some classic works of English history in the late 19th century, this type of analysis has been discredited in the history faculty since the turn of the 20th century. This wooly thinking underscores why law is not a truly academic subject. One only has to read other works - e.g. Atiyah on Freedom of Contract (outdated by decades immediately on publication) to pick up on this. Many thanks for the interesting comments. The article originally appeared as a post on my blog. I just decided that, from time to time, I would do short posts on legal history aimed at the general reader who may wish to see just the basic picture. I entirely agree that nobles / feudal magnates were immensely powerful figures in the Middle Ages. (Part 1 ended at 1066). They literally held the power of life and death over those within their domains and administered a fierce law within their own seignorial courts. I have made a start looking at that in Part 2. The series merely aims to inform and to stimulate interest in a subject which is nowadays almost totally neglected in law schools.